Listen to a summary of all the sessions at IndieWebCamp Berlin 2018! First of all, if you aren't subscribed to the IndieWeb newsletter, you definitely should! (available via email, RSS and h-feed). At the top of the newsletter, it includes a list of upcoming IndieWeb events. This list is generated by looking for all the events on our indieweb.org/events page, and extracting the data from the embedded Microformats there. Previously, the script looked only at the list of events on that page, rather than fetching the event information from the event's permalink. Today I updated the script to first look at the event permalink to extract location information from there if present. Otherwise it falls back to getting location information from the event in the list. Since the list view doesn't show venues but the permalink does, this means we can now show the venues the events are happening at! Since Homebrew Website Clubs are popping up all over the place (we're up to 8 cities this week! ), I updated the display to show them as a list instead of inline. 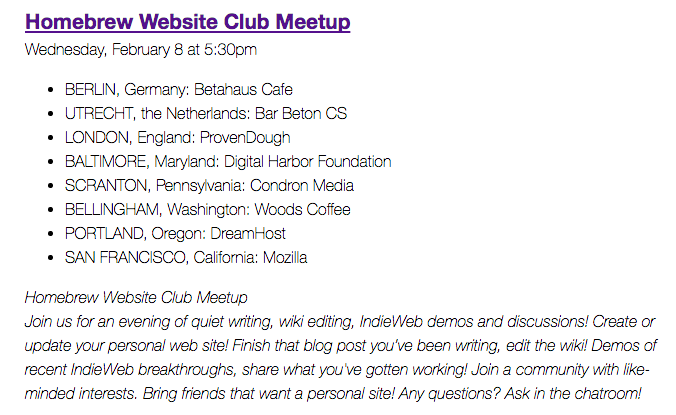 Now the Homebrew Website Club events look like this in the newsletter!